Borrowed from Yiddish בייגל‎ (beygl), ultimately from a diminutive of Middle High German bouc, boug- (“ring, bracelet”), from Old High German boug (“ring”), from Proto-Germanic *baugaz (“ring”); compare obsolete English bee (“ring, metal ring, bracelet”), Middle English bege, beh, Old English bēag, bēah, Old Frisian bāg, Old Saxon bōg, Middle Low German bōg, Old Norse baugr; also compare dialectal Austrian German Beugel, Beigel. See also beag. A toroidal bread roll that is boiled before it is baked. (tennis, slang) A score of 6-0 in a set (after the shape of a bagel, which looks like a zero). The Scot, who had been close to a two-set deficit in his semi-final against David Ferrer, avoided the dreaded bagel by seeing off a set point at 5-0 down before finally breaking the Djokovic serve to love as he began to go for his shots with the set seemingly gone. (slang, ethnic slur, South Africa) An overly materialistic and selfish young Jewish man. (tennis) Achieve a score of 6-0 in a tennis set. (sports) To hold an opponent to a score of zero. “bagel” in Douglas Harper, Online Etymology Dictionary , 2001–2019. 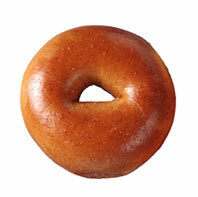 Borrowed from English bagel, from Yiddish בייגל‎ (beygl). From English bagel, from Yiddish בייגל‎ (beygl); ultimately from Middle High German bouc, boug- (“ring, bracelet”), from Old High German boug (“ring”), from Proto-Germanic *baug- (“ring”) plus *-il (noun suffix).